What mysteries lie beneath the Aegean Sea? What treasures are just waiting to be discovered? Appearing as a relic from the deep, this modern version of an ancient bracelet design is as wearable today as it was thousands of years ago. In this step-by-step wire jewelry tutorial, loaded with detailed photos and instructions you�ll re-create this cuff style bracelet which is reminiscent of an Ionic column from ancient Greece. After crafting your bracelet you�ll have three patina options, including the vivid turquoise patina that mirrors the intense blue hues of the Aegean. Here's what one customer said who had just tried it for the first time. "I love this tutorial....been waiting for it for a long time. My new bracelet looks great!. Thanks!" After I receive your payment, I'll deliver your tutorial via email in a downloadable and printable PDF file. I know you'll really enjoy this fun Aegean Cuff Bracelet tutorial. USD $9.00	- Click Here to Purchase. 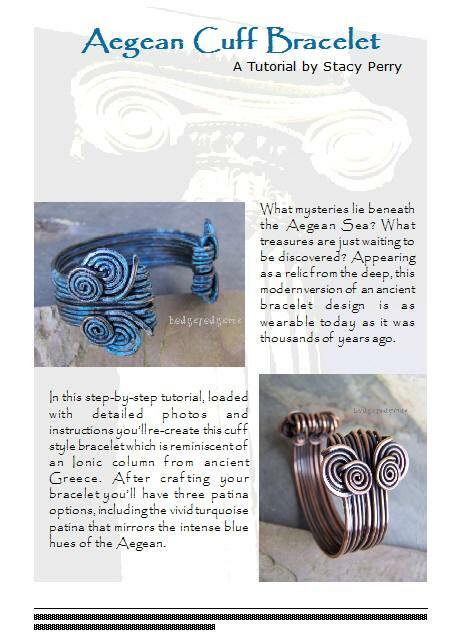 Return from "Aegean Cuff Tutorial" page to "Wire Jewelry Tutorials" page.